ZURICH (Reuters) - Novartis's generics chief is quitting after the Swiss drugmaker sold parts of the business and initiated an 18-month revamp, fueling speculation about an eventual spin-off or sale. 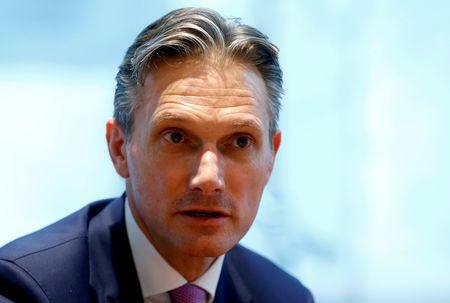 Richard Francis, Sandoz's boss since 2014, is stepping down, Novartis Chief Executive Vas Narasimhan said on Thursday, adding "Richard has decided that for personal reasons he cannot commit to stay with Sandoz until the transformation is completed". Francesco Balestrieri, head of Sandoz's Europe region, will become interim CEO to oversee what Narasimhan called "a multi-year transformation program" in which Sandoz re-focuses on biosimilars -- copies of patent-expired biological drugs made by rivals -- and hard-to-make generics like insulin. Balestrieri, at Novartis for 25 years, assumes control over a division with nearly $10 billion in annual sales. Sandoz last year sold a U.S. pills and dermatology portfolio to India's Aurobindo and embarked on a "de-integration" of Francis's division from the rest of Novartis, a process Narasimhan said will stretch into 2020 and clear the way for talks about the business's future. Narasimhan has been remaking Novartis by buying speciality treatments like nuclear medicine for cancer and gene therapy, while jettisoning an over-the-counter drugs business and eye surgery-and-contact lens division Alcon, due to be spun off as early as next month. The departure of Francis, a British citizen, does nothing to quiet conjecture about Sandoz's future within Novartis, analysts said. "We see our assumption confirmed that in the next 12 to 18 months a definitive decision may come about whether the generic unit will remain within Novartis," said Zuercher Kantonalbank analyst Michael Nawrath. "Even though the Novartis chairman said recently Sandoz isn't for sale for now, a spin-off like they're doing with Alcon would align with the strategy of becoming a focused, pure-play drugmaker."